Businesses face new pressures today. To compete, you need to move faster, deliver more and spend less. The Ricoh Aficio SP C320DN Color Laser Printer addresses these challenges and helps you succeed. This ultra-quick printer offers an Economy Color Mode that lets you choose when to print draft- or review-quality documents and when to print presentation-quality documents. This breakthrough capability fits perfectly with a Managed Print strategy that can help you monitor, control and improve output. Other new capabilities including an ECO Night Sensor that automatically powers down the printer after-hours and robust security features that safeguard documents and data deliver entirely new and sustainable cost savings. Optimize color toner use with a new Economy Color Mode that applies less toner for draft prints and presentation color for final documents. Select the right supplies for your workflow with a choice of conventional or high-yield cartridges which add to your cost-per-page savings. Print high-quality presentations, proposals and other documents in brilliant color with resolutions up to 1,200 dpi. Produce full-color photos without connecting to a PC or installing software. Just plug an optional PictBridge-enabled digital still camera directly into the printer. Push productivity to a new level with a powerful 533 quick 26 pages-per-minute print speed whether you presentation color or black-and-white. 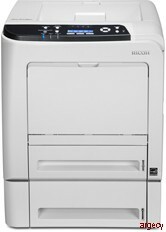 Handle large files without disrupting your workflow.The Ricoh Aficio SP C320DN offers expansive memory up to 768 MB. Keep projects moving fast, even with oversized documents through the Standard Tray or use the Bypass Tray for index) and banner printing (up to 8.5" x 49.6"). Spend less time replenishing paper with a 500-sheet expandable up to 1,100 sheet total paper capacity. Ensure efficient energy use with the new ECO Night Sensor that powers down when office lights have been off for an amount of time designated by the user. Save energy and time waiting for documents with less than 20 seconds warm-up time and less than 13.5 seconds first-print speed. Reduce paper usage and costs with standard automatic duplex printing a great solution for printing multi-page reports, plans, white papers or training documentation. Minimize toner usage with the new Economy Color Mode that lets you be selective about applying color to documents. Ensure that only authorized users have access to the Ricoh Aficio SP C320DN and the data stored within the printer with User Authentication. Prevent the interception of unprotected data streams with built-in network encryption capabilities. Configure the Ricoh Aficio SP C320DN with an optional hard disk drive and DataOverwriteSecurity System (DOSS), which automatically removes data from the hard disk drive after each job is completed. 15.8" x 18.9" x 15.2"